Sales results for 2012 have all been updated on our website. Generally speaking, real estate sales were good in 2012, especially compared to 2011. 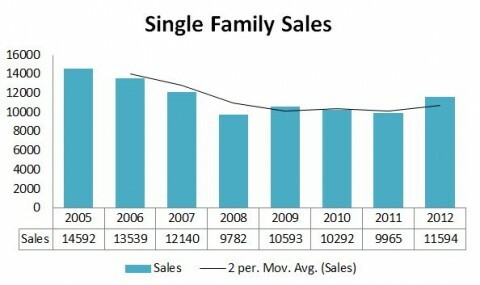 Single family home sales were 11,594, representing an increase of 16.3%, which is significant. Most counties, especially in Southern Maine, reported similar increases. Most towns are cities similarly reported gains in unit sales. Median pricing, however, was much more variable by towns and cities. Cumberland and York Counties are the two largest real estate segments in Maine and combined represent 40% of the market. Both counties experienced strong growth in 2012 and exceeded the state average, as volume was up 18.5% in Cumberland County and 17.3% in York County. These increases, however, are after several years of marginal or declining sales. As way of comparison, sales in 2005 for the entire state peeked at 14,592 units and dropped to as low as 9,965 in 2011. According to the National Association of Realtors (NAR) home sales nationwide are expected to be up in 2012 9.2% and a national median selling price should increase 6.3% to $176,600. Detailed sales reports are included at: Maine Real Estate Sales. Here you will find detailed comparisons by county and selected cities. We have also added new graphs for single family homes and condos that illustrate sales back to 2005 – the time when the real estate market had pretty much reached its peak. To investigate sales in your town or city more closely, you can begin your investigation at Local Community Profiles and follow the link to Sales Statistics.